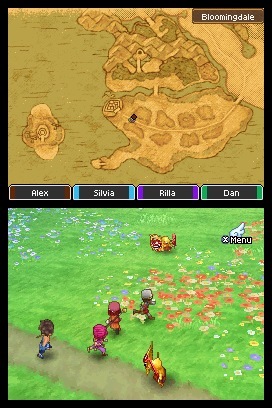 Battle alongside your friends in Level-5's upcoming DS RPG. Role-playing fans have a lot to look forward to this summer, as Nintendo plans to release Dragon Quest IX: Sentinels of the Starry Skies on July 11th. This immensely popular DS adventure has already sold more than four million copies in Japan and should find an audience in the U.S., thanks to four person co-op, attractive graphics and of course, the Dragon Quest name. Sentinels of the Starry Skies takes place in a kingdom of guardian angels, charged with protecting humans in the mortal world. In addition to watching their backs, these heavenly beings desperately want to enter God's Land, but cannot do so until they produce Goddess fruit, achieved by acquiring Star Auras to power the World Tree. After the game's hero finds some, a mysterious and evil force attacks the angels, scattering them to the realm they swore to protect. The lead character wakes up, sans wings and halo, and sets off on a journey to return to the kingdom. 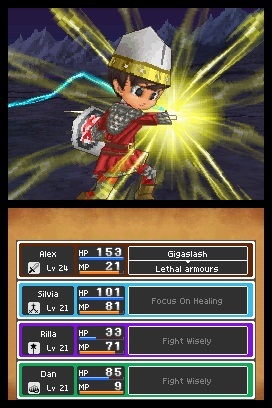 What's unique about DQIX, aside from the narrative, is the ability to create the hero from scratch. The game allows players to customize the character's gender, build, height, skin tone, eye shape/color and hair style/color. They can even outfit their warrior with a plethora of items, including a weapon, shield, helmet, body/leg armor, boots, gloves and various accessories. On top of that, they'll choose a class to specialize in. Six are available from the start (soldier, warrior, magic user, thief, priest, traveling performer) and gamers will unlock another six (warrior-mage, ranger, battle-master, paladin, superstar, sage) as they progress. Later, they'll find Alltrades Abbey, which lets them switch jobs without losing their spells, so if someone begins the game as a priest but feels like becoming a ranger, DQ IX gives him or her that opportunity. Turn based battles play out from a third person perspective, but players now have the option of avoiding most confrontations by staying away from over 180 different monsters. As they level up, weaker creatures will even run away in fear. Four-player offline co-op, however, should make the game's tougher enemies easier to beat. Three other warriors can wirelessly connect to someone else's game and jump-in/jump-out at will. Not only can they help the player in battle, but they can also choose not to fight and continue questing. That's a wonderful feature. We just wish there was an option to play online. On that note, the gamers can still download new quests and items through Nintendo's Wi-Fi Connection. All of this should make Dragon Quest IX: Sentinels of the Starry Sky quite popular when it debuts in a couple of months. We'll post a review shortly after its release.